Days after Narendra Modi made his first public admission of marriage to Jashodaben in his election affidavit, the spotlight is firmly on the Modis of Mehsana — the extended family of the BJP’s prime ministerial candidate. As Modi’s in-laws scramble to tackle the media frenzy, and rally together for the “jamaai who will be PM”, his own relatives happily recount tales of his younger days. TV sets in community homes across the Vadnagar and Unjha talukas constantly play news channels, which seem to be stuck mostly on Jashodaben. The retired village schoolteacher from this nondescript part of north Gujarat has suddenly become a national headline. Ashok alias Pravin Modi, Jashodaben’s younger brother who runs a grocery shop from his house in Unjha, has sought refuge at an unlikely location — the Ahmedabad home of Modi’s eldest brother Somabhai. It’s a reunion that has taken nearly four decades and Modi’s biggest election to happen. “I am facing a lot of pressure from our community who are alleging that we are taking money and giving interviews to the press. I am currently at Somabhai’s residence in Ahmedabad and will return tonight. I can only speak after the elections are over. I am not at liberty to discuss anything before that,” Ashok told The Indian Express by phone. 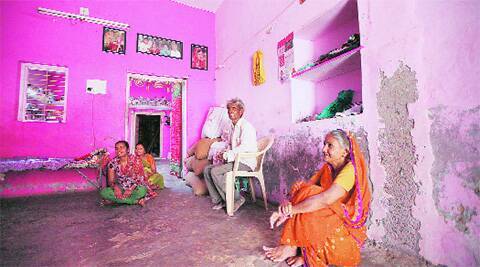 Jashodaben, known as ‘Jassiben’ at home, is, according to the family, on a pilgrimage that will end only on May 17, the day after the results. She is unlikely to cast her vote on April 30. Ashok’s wife Jayaben and their daughter-in-law Daksha, who are in Unjha, claimed that Jashodaben does not know that Modi has acknowledged their marriage. There is no visible bitterness about the fact that Modi has shunned Jashodaben for so long. Instead, the family is celebrating the journey that they hope will take Modi to the country’s top job. “We would love it if Modi became PM. It would be a matter of great pride for our community. We will call a press conference and feed all visitors to our home,” says Daksha, at whose home Jashodaben stays the most often. The two women are clued in about the activities of Modi’s side of the family. “Wasn’t it Prahlad who was recently in Varanasi to campaign?” asks Daksha, referring to the second of Modi’s two elder brothers. 20 km from Unjha, at Brahmanvada, there is similar excitement. Brahmanvada is from where Jashodaben hails. Her youngest brother Kamlesh Modi is out for work, but Kamlesh’s wife Sita and their son Jay enthusiastically point to the Brahmanvada primary school building opposite their home — the venue of the wedding. Modi’s own extended family has not seen its famous son for years, but is nonetheless eager to share whatever they know about him. Vimala, the wife of Modi’s first cousin Ashok who lives in Kala Vasudev ni Chanchri near Modi’s childhood home in Vadnagar, produces a photo of her father-in-law Narsinhdas Modi, the brother of Modi’s father Damodardas. “My husband does not have a fixed job. For the last two years, he has been selling children’s toys from a small handcart, and we have difficulty making ends meet. But we have never reached out to anyone in the Modi family. He has told me not to speak to anyone because no one will help us,” she says. “Recently Pankajbhai (Modi’s youngest brother) visited Vadnagar to fix his son’s wedding with a girl from here but he did not visit us. We do meet Somabhai at social events, though,” Vimalaben says.